You may wish to print off two sets of digit cards to cut out and play with. 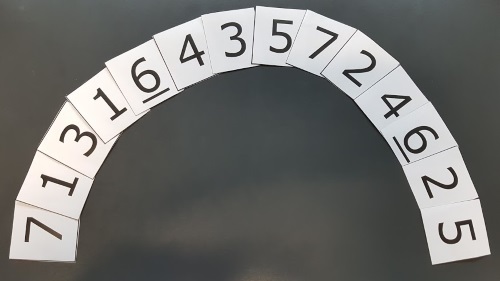 In this arrangement there is one number sandwiched between the "1" cards, two numbers sandwiched between the "2" cards, but only one number sandwich between the "3" cards. Is it possible to make a complete sandwich with one number between the "1" cards, two numbers between the "2" cards, and three numbers between the "3" cards? Click and drag the leftmost number in each pair. The number on the right will move with it. Can you make a complete sandwich with 1, 1, 2, 2, 3, 3, 4, 4? It is also possible to make a sandwich using 1s, 2s, 3s, 4s, 5s, 6s and 7s. Can you find an arrangement? Click below to see one possible solution. Is yours the same? If you have any problems using the interactivities you can use the versions on the GeoGebra website: Sandwiches Interactivity. If you enjoyed this problem, you might like to try More Number Sandwiches. Interactivities. Resourceful. Visualising. Games. Addition & subtraction. Working systematically. Trial and improvement. Resilient. Factors and multiples. Selecting and using information.